“MMMMMMMMMMM” and “these are to die for” were the comments I got from my guinea pigs, I mean friends I care about, to whom I sent in a batch of Chocolate Peppermint Cocoa Brownies. You see, I did not have a choice but to get them out of my house. I made them and found that I could not STOP eating them. As a general rule, I tend to be one who is able to walk away when I am full, especially if it is from a dessert I have made. This is because I know that the dessert will be there in the morning should I want more. When it came to these brownies, this was not the case. About four years ago, Joshua got on a peppermint cocoa craze. It may not be a big deal in your household, but in mine, when said 17 year old (at the time) stepped foot in the kitchen to prepare anything, it was a major moment. What else could a wonderful, caring mom do, but help find other ways to feed her baby boy peppermint cocoa? My original idea was a cookie, which was really yummy. Yet, as of late, I have been baking a lot of cookies and so I wanted to twist the recipe around to create a brownie. Add to that my Pavlovian side, which as of late has had trouble seeing a Peppermint Chocolate Bark candy that I have NOT bought, and it meant I had to figure this out. What I got was an incredibly deep dark chocolate brownie that is bursting with flavor from the peppermint baking chips (buy the chips now, as that are only available during the holiday season.) I could have stopped at the brownie layer, but quite frankly, why? The addition of the chocolate peppermint ganache makes these brownies so deliciously decadent. Add on more peppermint baking chips and this is most definitely a dessert that you will bake and share often this time of year. After all, the only alternative that makes any sense is to bake the batches and eat them all yourself. If you choose to go this route, consider yourself forewarned! I did not realize just how ‘seasonal’ the Peppermint Baking Chips were until I received an email from one of you. After realizing just how difficult it can be to get the Peppermint Baking Chips, I decided it was time to implement Plan B, which I made up on the spot. I bought Ghiradelli Chocolate Peppermint Bark squares, cut them up and used them instead of the Peppermint Baking Chips. Great news…the taste is just about the same. The top is not quite as dramatic without the bright pink/white, but they do look and taste fabulous. You do not need to use the Ghiradelli brand. Your favorite Peppermint Bark will do the trick. Thank you Nancy P. for helping us avoid some very frustrating shopping moments! Preheat oven to 350°. Line a 9” x 13” x 2” pan with aluminum foil. Begin by turning the pan upside down. Fit the foil over the pan. Invert the pan and place the foil into the pan. Melt 1 tablespoon of butter and grease the foil with melted butter. Set aside. Melt the remaining 16 tablespoons butter, semisweet chocolate and unsweetened chocolate together in the microwave. Set aside. Whisk the flour, cocoa and baking powder together and set aside. Beat the eggs just until combined. Add sugar and brown sugar and beat until light and airy, about 2 minutes. With the mixer running, add ½ of the melted chocolate mixture, then add ½ the dry ingredients. Alternate until all of the chocolate and dry ingredients are mixed in, scraping the bowl down as needed. Add the vanilla. Lastly mix in 8 ounces of the peppermint crunch baking chips. Transfer the batter to the prepared pan and use a spatula to spread it evenly around. Bake at 350° for 25 minutes. Remove from oven and cool completely in the pan. Combine the chocolate chips, butter and cream into a microwave-safe bowl. Microwave until the chips are nearly melted (about 2 minutes). Stir until smooth. Add peppermint extract. Stir until combined. Remove the brownie from the pan by lifting the foil. Peel the foil away by either lifting the brownie up and pulling the foil back or invert the brownie onto a wire rack and then peel the foil off. Either way, after the foil is peeled off the brownie layer, transfer the brownie to a large board or tray. Use a small metal spatula to evenly spread the chocolate peppermint ganache over the top. Sprinkle the remaining 2 ounces of peppermint crunch baking chips over the chocolate topped brownies. Refrigerate at least one hour to set. Cut into bars once the topping is set. Chocolate Peppermint Cocoa Brownies may be frozen, but be warned, they are as delicious frozen as they are at room temperature – or any temperature in between! O.M.G! These sound so amazing. I have to think of some reason to make these. Or better yet, maybe I can think of some occasion for which YOU could make these and give them all to me! TeeHeeHee! You are a funny lady Alexis! I know you will make an amazing batch of these decadent brownies and I can’t wait to try one once you do! Betsy do you use sweetened or unsweetened cocoa for this recipe. These look unbelievable. I can’t wait to try them. Nancy, I use unsweetened cocoa. I shall change this in the recipe to help avoid confusion for others, too. Thanks for asking and enjoy the recipe. I made these DELICIOUS brownies yesterday and noted two things. 1. If you have the semi-sweet baking squares you can use those and just chop them down instead of the 3 oz. semi-sweet chips in the brownie portion of the recipe. 2. Do not omit using the aluminum foil to line your pan. I did and sprayed my pan instead. The brownies came out just fine. However. I flipped them onto an aluminum foil but when I went to flip them back over to put the ganache onto it, the brownie broke apart. Now mind you, this does not take ANYTHING away from the incredible taste, just the beauty of the brownie. I could not find the peppermint crunch chips so I used Trader Joe’s Peppermint Bark. This was still good but not nearly as pretty. I will have to remember to keep my eyes open next year and snag the bags when they first come out onto the shelves. Thanks Nancy. You inspired me to do some research on the availability of the peppermint chips, which is now posted before the recipe. I greatly appreciate your comments. Can you please tell me if these freeze well and if not, how many days in advance of serving can they be made and how they should be stored. Thanks. The Chocolate Peppermint Cocoa Brownies freeze beautifully. The only problem that I have when I freeze mine, is that I LOVE eating them frozen. The brownies disappear too quickly! Well, you’re right: they disappear, quickly. Some did make it into the freezer; unfortunately, I had too many takers before they even got into the freezer. These, truly, solve my Christmas gift dilemma. Last year I made about 9 or 10 of your Banana Breads and took them to friends’ houses. This year, it’s going to be the Chocolate Peppermint Cocoa Brownies. I had to wait, almost, a year for the Andes Peppermint Crunch baking chips to make their way to the Walmart shelves and once they did, I practically emptied out the shelve.The Brownies are just beautiful to look at and absolutely delicious to eat. Thank you. 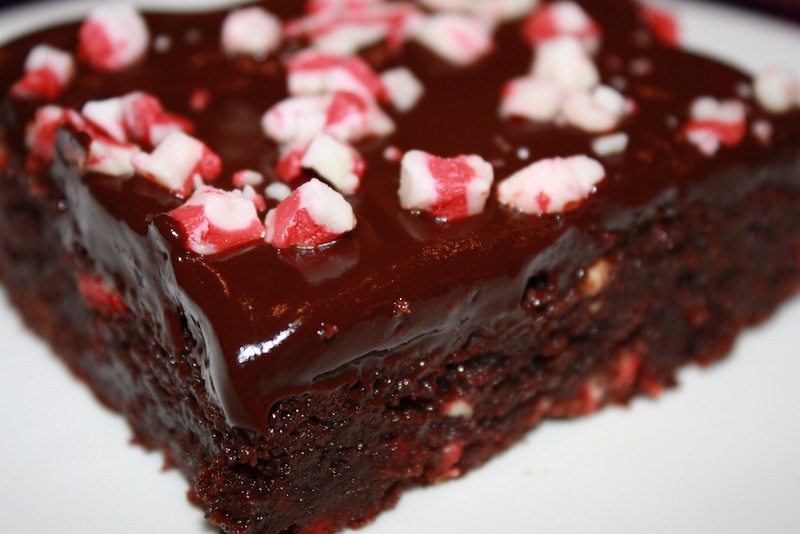 Your friends are very lucky to receive Chocolate Peppermint Cocoa Brownies for the holidays. Stock up on the chips and you will be loved by all at Valentine’s Day, too! What a beautiful treat to serve at Christmas-time! I stock up on those chips all the time–have to ensure access year-round, after all! You are so smart to stock up on those delicious peppermint chips. They are really fabulous anytime of the year!